Top: A young Festival goer races a solar car. Photo by Flannery Allison. Bottom: A speaker from Shaw Nature Reserve presents on landscaping with native plants. Photo by Julie Heck. Thanks to all for their participation in the 2018 Green Living Festival on Saturday, June 2, 2018. We appreciate each organization's efforts and enthusiasm while teaching attendees how to live green! The Green Living Festival began in Grandel Square in Midtown St. Louis, former home to the EarthWays Center offices and staff as the Green Homes Festival. The 2011 Festival marked the first time the Green Homes Festival was combined with the Healthy You Healthy Planet Festival and was held on Garden grounds. 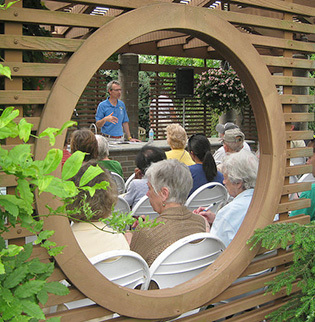 In 2014, the Green Homes Festival was moved to the Kemper Center for Home Gardening area of the Missouri Botanical Garden, and was held in early summer. 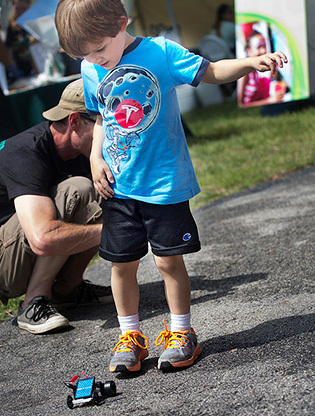 The 2015 Festival was held at the Butterfly House in Faust Park. Use the quick links at right to view archives of past festivals. We hope to see you at next year's Green Homes Festival! Return to the Festival Archives main page. Return to this year's Festival webpage.